It’s approaching dusk on an alien world, and the only eyes to witness the scene belong to a machine that has traveled billions of miles to be here at just this moment. Sunlight is filtered through an atmosphere filigreed with layers of haze, and even areas that should be cast into total darkness by the shadows of vast mountains are illuminated by a diffuse glow. Light streaming through gaps between those mountains falls obliquely on a low-lying haze bank, revealing itself as luminous beams in the sky, like those of a dramatic Earthly sunset. 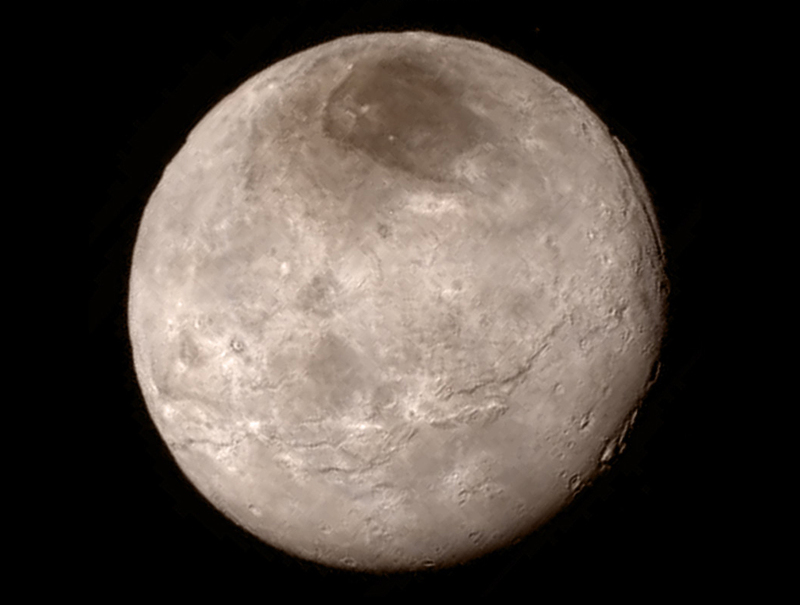 The world is Pluto, the far-from-home machine is New Horizons, the atmosphere is a tenuous skin of nitrogen, carbon monoxide, and methane gases, and the hazes permeating that atmosphere are suspended organic particulates. Few — if any — of us expected such an alien, remote, and hostile place to look so familiar in twilight. 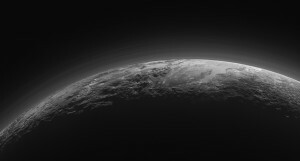 Just a few days after New Horizons’ flyby of Pluto, a new set of images came down that surprised us all: a simple look-back at the edge of Pluto, backlit by the sun. 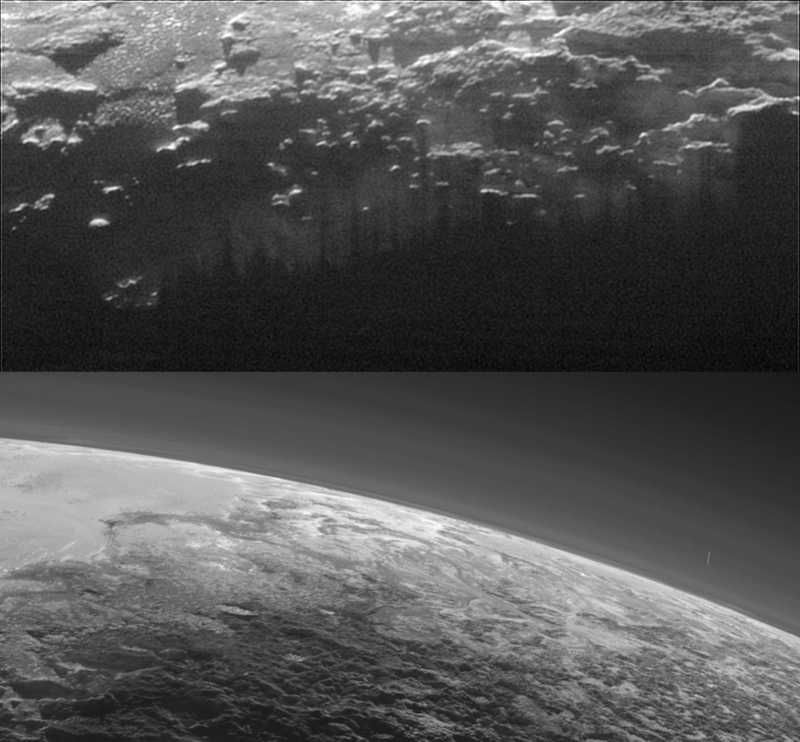 Very little of Pluto’s surface was to be illuminated in these images—just a tiny sliver of a crescent. 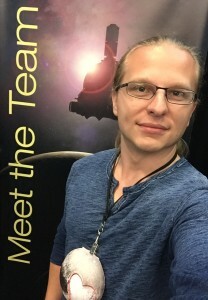 When the images appeared, several of us who routinely process New Horizons images to enhance their detail opened them to see what we could do with them. Pluto was surrounded by a brilliant halo, extending far above its surface. The halo was not smooth, either; it was cut through by sharply-defined brighter layers. This halo was our first glimpse of Pluto’s stunningly complex atmospheric haze. We had known for decades that Pluto had an atmosphere and that it might be hazy. 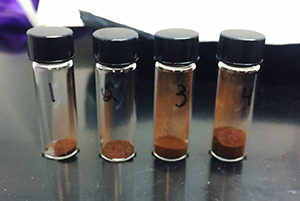 What we didn’t expect was just how bright and structured those hazes might be. We set to work trying to understand what these images might tell us about the nature of the hazes and the dynamics of Pluto’s atmosphere. One of the ways we examine the structure within these images is to “unwrap” them—to peel the planet’s circular horizon back into a straight line. In these unwrapped images, structures that extend radially within and beyond the edge of the planet stand vertically, while concentric layers within the atmosphere appear as stacked horizontal features. In these unwrapped images, the hazes appear brighter in the evening sky than in the morning sky, possibly suggesting that the hazes and their distribution are controlled by diurnal processes, becoming more concentrated over the course of Pluto’s long day and depleting during Pluto’s long night. Perhaps the haze particles gently rain down onto the surface through the night, staining Pluto with a distinctive reddish cast, or perhaps other atmospheric processes act to move and concentrate the haze. Another feature in the unwrapped images struck us: subtle bright traces running inward along the planet’s edge, well beyond where the sunlight should be touching its surface. 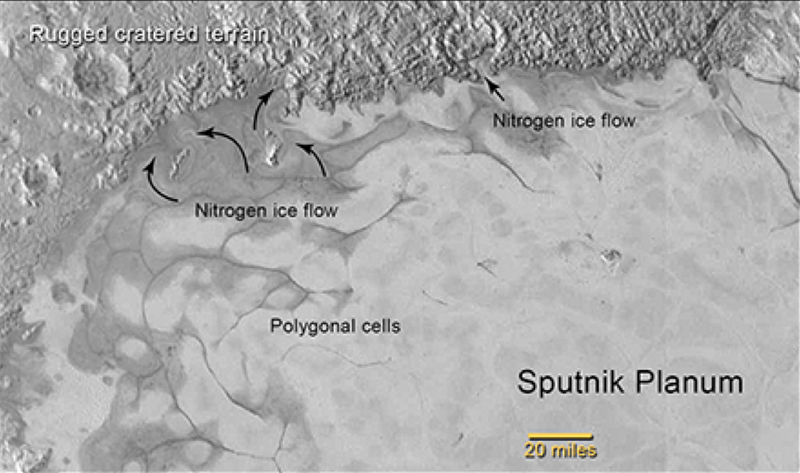 These had the characteristics of “crepuscular rays” — beams of sunlight illuminating particulate in the atmosphere — cast between gaps in topography near Pluto’s terminator. 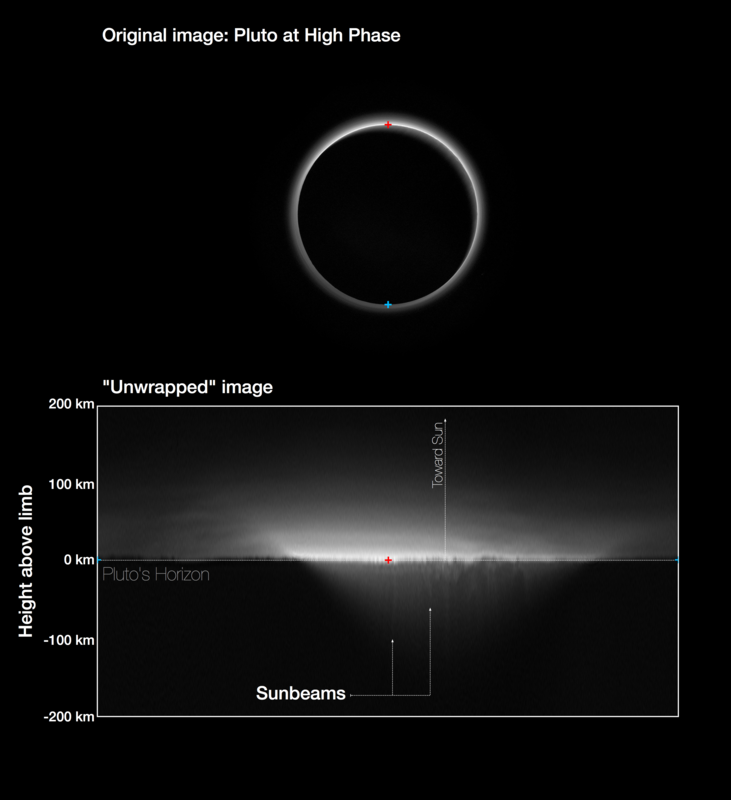 Simply put, we thought we might be seeing sunbeams in Pluto’s twilight sky. The most spectacular and unequivocal example of these came as their counterpart: long, narrow rays of shadow cast in an otherwise bright haze. 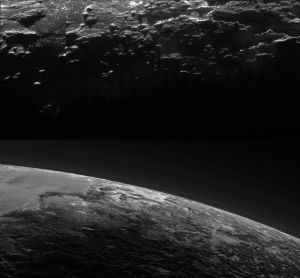 These appeared in the recent stunning Ralph image of Pluto’s landscapes in twilight. 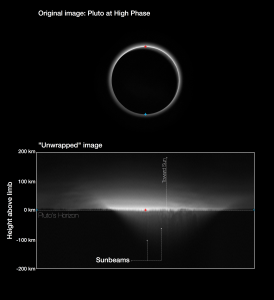 Their presence indicated that Pluto’s hazes are not limited to high altitudes— some must hug the surface, similar to a low cloud deck or a fog bank. 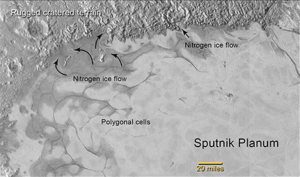 This same MVIC image revealed many more fine, high-altitude haze layers, including discontinuous, quasi-periodic structures suggestive of shaping by atmospheric waves. 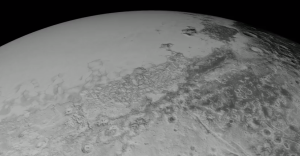 More images of Pluto’s skies are coming back from New Horizons. With each one we learn more about this distant world’s delicate atmosphere with its tracery of hazes, but we still have many questions left to answer. 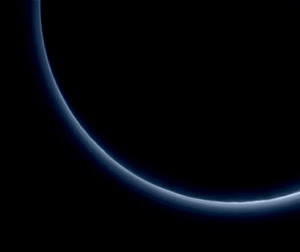 How does Pluto’s atmosphere interact with and shape Pluto’s surface? How is the atmosphere evolving as Pluto’s orbit caries it farther from the Sun? How do Pluto’s hazes relate to those of other worlds — including the hazes likely present in the Earth’s early atmosphere? Earth, again. There is much about Pluto that is exotic and superficially incomprehensible, but beneath that there is a constant theme of familiarity. We can imagine that a far-flung human explorer, standing on the cracked and pitted ice of Tombaugh Regio, might gaze upward at the twilight sky and think it looked a bit like home. An exhilarating, pioneering journey came to fruition on July 14, 2015, as NASA’s New Horizons spacecraft made its successful flight through the Pluto system, recording 60 gigabits of data that it is beginning to send to Earth. 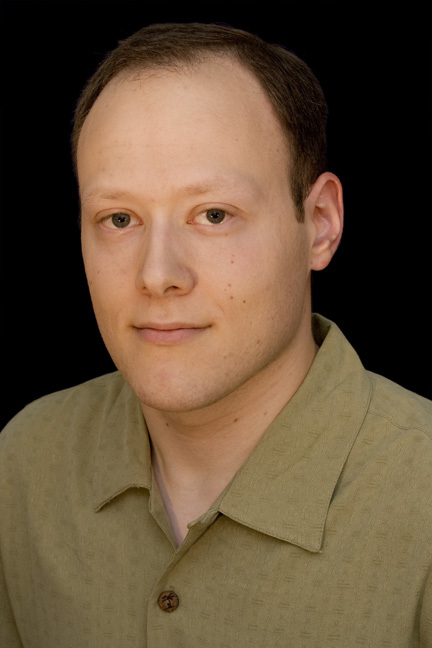 I’m Stuart Robbins, a research scientist at the Southwest Research Institute in Boulder, Colorado. 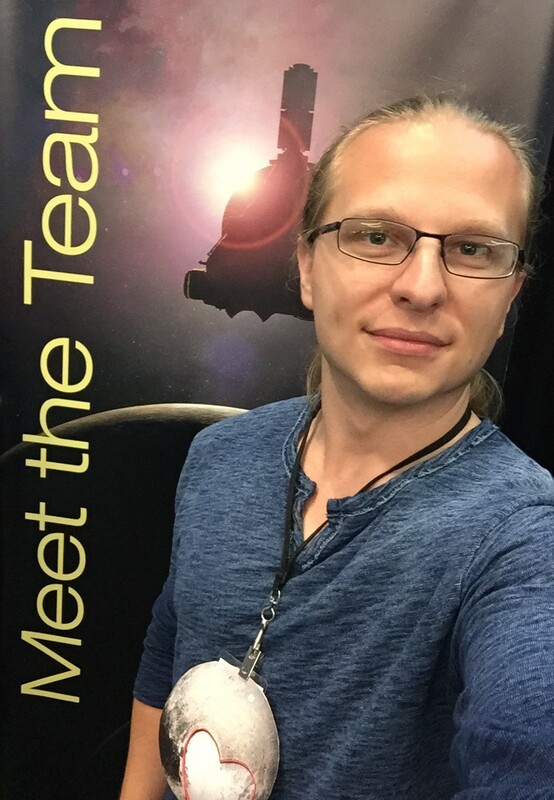 While I only came onto the project relatively late – in 2012 – I’ve been able to interface with many different groups and people on New Horizons because my primary role was in planning. 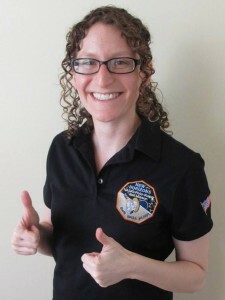 The New Horizons mission is one of opportunity, not just in exploring a world in a region to which we’ve never been, but also for people who have a variety of backgrounds, interests and skills. One of my hobbies has been exploring computer-generated images and animations, and I volunteered to create the fly-through animation on this page. I strive for realism, so my first step was to build an accurate Pluto system within a 3-D environment. I used the latest data on Pluto’s orbit, its obliquity (how its pole is tilted relative to its orbit), and the orbits of all the known moons to create the system in software. I then “attached” a camera to the latest trajectory information so it would be as if you had a seat on New Horizons, watching Pluto as you zoomed past. I also worked on the lighting so that even the shadows as the spacecraft passes are at the correct angles, and the crescents during departure are at the correct positions. 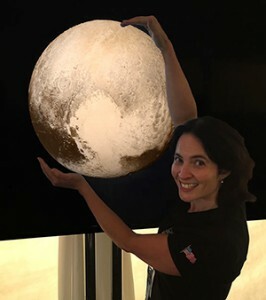 In my original version, each frame (1/30th of a second) represented one minute of real time, and the field of view was that of the Long Range Reconnaissance Imager (LORRI), New Horizons’ eagle-eyed, black-and-white camera that gives us our closest views. Unfortunately, the result was cinematically questionable, at best, because of the very brief time that the spacecraft gets its best images and the extreme change in distance between the spacecraft and planetary system over the course of July. I needed an alternative. The final result was made differently: First, the timescale had to be variable. The final product goes from one second of movie time equaling 30 hours at the beginning and end, to one second of movie time equaling 30 minutes for the closest-approach section. Second, the field of view could not remain as LORRI if the trajectory were to be realistic. I varied the field of view so that you can see the whole system at the beginning and end, and you can still see Pluto almost as a whole disk during the closest approach. Third, the camera’s target – what’s in the center of the field of view – had to also vary. The movie starts and ends with the camera targeting the barycenter, the mutual point around which Pluto, Charon and the other four moons orbit. As the movie appears to zoom in for the Pluto flyby, the focus shifts to Pluto itself, and then it moves off Pluto so that it does not appear as though you are about to crash into the surface nor fly through the planet. The camera target remains on Pluto for the solar occultation – when the sun passes behind it – and then moves back to the barycenter for the solar occultation by Charon. Beyond that, everything about the movie is accurate: The Pluto hemisphere we see on closest approach, the lighting and shadows, the atmosphere’s size (though its brightness has been increased), the orbits of the satellites, the colors are our best estimate for what your eye would see, and so on. In addition, this movie retains Celestial North as “up” so that there are no twists, turns nor odd reorientation during the flyby. The final result is the system as New Horizons saw it at the beginning of July 2015, flying to Pluto for its close-up on July 14, complete with the best maps we have to-date. It’s an incredible look at system we are unlikely to revisit in our lifetimes – though we have the potential to visit other bodies farther still from the sun with the craft as it continues to reveal new horizons in our solar system.